Charm is not a word usually associated with Holocaust remembrances, but take a look at “Three Promises,” the Serbian short with English subtitles that had its world premiere at the New York Jewish Film Festival. It tells the story of Serbian Jewry through beautifully animated collages of black and white photographs from one family’s album. The album survived the Nazis. Most of the family, like almost all of Belgrade’s 10,000 Jews, did not. The album brings them back to life. It’s a valentine to the past, combined with the horrors. Almost overloaded with Belgrade’s Sephardic Jewish history, the script by Edward Serotta tells the love story that triggered “Three Promises”: the promise a wife made to her husband to protect their daughters, the promise a priest made to this woman to hide the girls, and the promise one of the daughters made to herself that the priest would be recognized as a Righteous Gentile. The love story is extraordinary. A Slovene Catholic woman visiting relatives in Belgrade falls in love with a man who is Jewish and crippled. She embraces not only him but his family and his religion. Years later, thanks to a Slovene priest in Belgrade, their two daughters survive to tell the tale. All is done with a light touch to piano, bird songs, a choir of young voices and the stunning operatic mezzo-soprano of one of the daughters. Delicately told, yes. Candy coated, no. Horror plays a major role. A tiny paper cutout of a van to gas its occupants toddles across a black and white photograph of the Jewish hospital where the girls last see their father. A pastel map of 1930s Europe turns brown with an excrement-colored coating pouring from Germany into Austria, Czechoslovakia, Poland, France, Belgium and Holland. The 19-minute film is finding an audience. “Three Promises” will be shown at the Cincinnati Jewish and Israeli Film Festival Feb. 16. A major public screening is set for March 15 in Belgrade, presented by the Jewish community and underwritten by the German Embassy there. That same day in New York, the Sephardic Jewish Film Festival will be screening “Three Promises” at the Center for Jewish History. And you can screen it here. Serotta, the journalist, photographer and filmmaker who directs Centropa, the Central Europe Center for Research and Documentation in Vienna, hopes the film will be used for Holocaust education in Serbia and Slovenia. But why limit the film’s message to parts of the former Yugoslavia? Not just a deeper awareness of Holocaust history but an appreciation of the power of humanity hopefully won’t fall on deaf ears elsewhere. And if it does, there will be subtitles. A propos of the Lilith cover story on naming ourselves, the female names in “Three Promises” tell the tale: the Catholic woman who took a Jewish first name as well as her husband’s Jewish family name; their daughters, who changed their first names to non-Jewish names and took their mother’s Catholic family name to protect themselves; and the one daughter who kept her Christian name after the war to honor the priest who saved her life. There should be research on whether a sub-industry exists of women documentary-makers digging into uncomfortable family history. Certainly this Dutch film is a case in point. Simonka de Jong wanted answers to the bizarre and hurtful behavior of her grandfather Loe de Jong, a leading researcher on World War II Dutch history. After his death, de Jong’s family discovered personal documents that he had concealed about his twin brother, whose fate had been unknown to his children. Fiction might have been more satisfying than reality in this tantalizing hunt for the truth. But certainly a young filmmaker’s attempt to bring family members together in search of answers is worth recording as time runs out on those who remember the war. 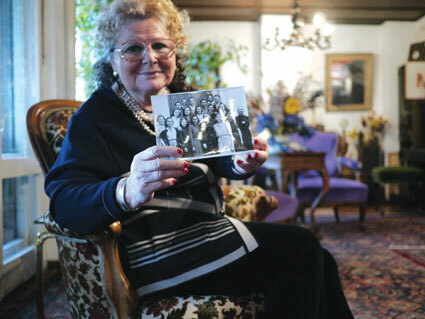 Another Holocaust mystery in Holland. In this case, Israeli filmmaker Yasmine Novak presses her mother, Ellis, to go back with her to the Netherlands in search of clues to the fate of the first great love of her life. When he didn’t return after the war, Ellis married another man and they moved to Palestine. Until her husband died, 65 years later, she never opened the diaries of her first love, written in the underground. Stranger than fiction, she had received the diaries, sender unknown, on her wedding day. It’s a slight film propelled by an aging woman’s frantic but no-nonsense search for anyone in Holland who might know about her first love’s fate. And there’s the underlying time-travel irony that if this woman had been reunited with her first love after the war, the filmmaker daughter would never have been born. It’s the love stories and the mysteries of the Holocaust that can bring something fresh.